With Valentine’s Day just around the corner, romance is the air and there is no place better to get that romantic feeling than here in the Finger Lakes. Here are our Top Five Romantic ideas for Valentine’s Day …..or anytime! 1. Toast your loved one with a romantic, candle-lit dinner for two at the Aurora Inn. Their Valentine’s Day menu will include the regular (although nothing about the cuisine at the Aurora Inn is ‘regular! ), a la carte menu plus the chefs will be preparing a special tasting menu complete with wine pairings. Think about spending the night in one of their luxurious rooms to make your romantic evening complete! 2. Book the ‘Truly, Madly, Deeply In Love” package February only special at the luxurious 10 Fitch B&B in Auburn’s historic district. The package includes a dozen roses, candlelight, rose petal and chocolate turn down service, breakfast in-suite each morning, in-suite 60 minute Swedish massage, cheese plate & sparkling juice, chocolates, and romantic goodie bag. Available throughout the month of February with a two- night stay. 3. Give the gift of wine that will last all year long with a 2016 Cayuga Lake Wine Trail season pass. The season pass offers great savings to four trail events – Mardi Gras, Bacon on the Lakein, Wine & Herb Fest, and the Holiday Shopping Spree. Enjoy our fabulous Finger Lakes wines with your loved one throughout the year at these fun events! 4. Buy some Sweets for your Sweetie on the Finger Lakes Sweet Treat Trail. The Finger Lakes Sweet Treat Trail celebrates our locally grown and produced sweet products that are perfect for Valentine’s Day or any time of the year. Order a special pie or cake or cookies made from scratch with local products from Carolyn’s Creations in Cato or put together a basket of local maple syrup, honey, pancake mix, jams , jellies and preserves from New Hope Mills, everything you need for a romantic breakfast in bed! 5. Plan a special evening out with your loved one. Auburn Public Theater presents ‘PaulTheBeatle,’ a brilliant one-man Beatlemania-esque show with Bob Halligan Jr. portraying Paul MaCartneyon February 12th. Of course, you’ll want to plan a dinner before the show at one of downtown Auburn’s fine eateries! Toast your loved one with a romantic, candle-lit dinner for two at the Aurora Inn. Their Valentine’s Day menu will include the regular (although nothing about the cuisine at the Aurora Inn is ‘regular! ), a la carte menu plus the chefs will be preparing a special tasting menu complete with wine pairings. Think about spending the night in one of their luxurious rooms to make your romantic evening complete! Book the "Truly, Madly, Deeply In Love” package February only special at the luxurious 10 Fitch B&B in Auburn’s historic district. The package includes a dozen roses, candlelight, rose petal and chocolate turn down service, breakfast in-suite each morning, in-suite 60 minute Swedish massage, cheese plate & sparkling juice, chocolates, and romantic goodie bag. Available throughout the month of February with a two- night stay. Give the gift of wine that will last all year long with a 2016 Cayuga Lake Wine Trail season pass. The season pass offers great savings to four trail events – Mardi Gras, Bacon on the Lakein, Wine & Herb Fest, and the Holiday Shopping Spree. Enjoy our fabulous Finger Lakes wines with your loved one throughout the year at these fun events! 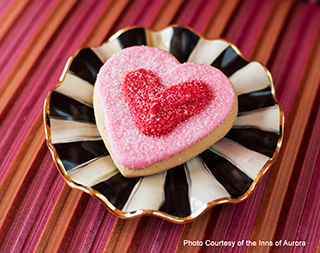 Buy some Sweets for your Sweetie on the Finger Lakes Sweet Treat Trail. The Finger Lakes Sweet Treat Trail celebrates our locally grown and produced sweet products that are perfect for Valentine’s Day or any time of the year. Order a special pie or cake or cookies made from scratch with local products from Carolyn’s Creations in Cato or put together a basket of local maple syrup, honey, pancake mix, jams , jellies and preserves from New Hope Mills, everything you need for a romantic breakfast in bed! Plan a special evening out with your loved one. Auburn Public Theater presents &apos;PaulTheBeatle,&apos; a brilliant one-man Beatlemania-esque show with Bob Halligan Jr. portraying Paul McCartney on February 12th. Of course, you&apos;ll want to plan a dinner before the show at one of downtown Auburn&apos;s fine eateries!